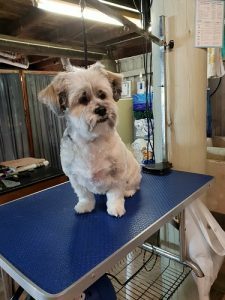 You are here: Home / Sharon's Dog Grooming Salon / Pet Groom of a Lhasa Apso. Pet Groom of a Lhasa Apso for traveling. I recently had the pleasure to meet Molly. 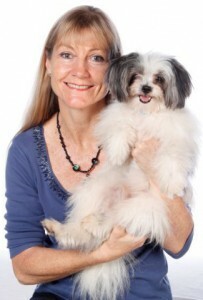 Molly is a Lhasa Apso and a very lucky little girl because she is traveling Australia with her mum and dad. I say living the dream, exploring new places every week. This is not a traditional Lhasa Apso cut. Her mum instructed me that she wanted her girl clipped short and to follow the previous groom lines for ease of caring for Molly on their travels. Molly was having issues walking apparently. She had had a grooming session before leaving Brisbane and her mum even took her to their vet thinking she was getting arthritis in her leg/foot (being 10 years old). The vet neither found or reported anything wrong. After my groom with Molly I showed her mum some pretty thick matting I had taken out from between both front paw pads (no wonder the poor little baby was having trouble). I must say I’m a little surprised that the previous groomer hadn’t noticed the problem with her paw pads during the grooming session. 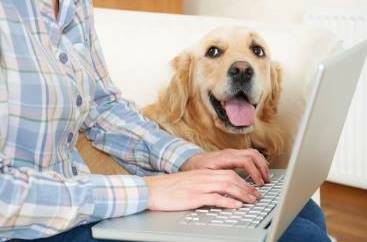 Because we work so closely with your fur babies we should be able to point out anything that is happening or different from their previous visits. If this had happened with Molly it would have saved her mum the cost of a vet visit. As it turns out the lovely little Molly is walking/running around happily now with no sign of any limp. I, also, can’t stress enough the need to check your dog all over when brushing/grooming them yourself. Check their ears, teeth, between their toes etc especially living up here in the tropics. We have so many nasties here from ticks and fleas to all the different grasses that can create so many skin and health problems for your fur babies, big or small.